Desiccants protect all types of articles from deterioration, rust, corrosion, mold, mildew and other damage caused by moisture or high humidity. Simply place desiccants together with the article to be protected in a tightly closed or sealed moisture resistant container. Desiccants will rapidly and actively desiccate the surrounding air and keep it that way to protect against moisture damage. the "forever" desiccant for a variety of applications. DriCan® is a small, perforated canister containing 40 grams of indicating silica gel. The case is lightweight yet strong, designed to withstand years of use. The desiccant content has a reversible action. Once it has adsorbed all the moisture it can hold, indicated by a color change from blue to pink, it can be regenerated easily with a conventional oven. After regeneration, DriCan® will be capable of readsorbing its full capacity. This cycle can be repeated over and over again, making DriCan® the "forever" desiccant. Sufficient material to protect up to 3 cubic feet (85 ltr) of enclosed space. DriCan® has no harmful effect on material with which it comes in contact. The content is chemically inert, non-corrosive, non-toxic, and odorless. DriCan® can be used to dry the air in all types of moisture-resistant containers and packages including glass jars, air-tight cans, plastic pouches, tool boxes, wall safes, display cases and many more. Contains 40 grams of active silica gel. 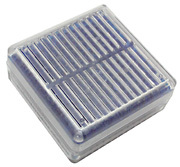 The DRI-BOX® is a small perforated plastic box containing indicating silica gel. The box is sealed on the side to prevent silica gel from spilling. The DRI-BOX® is convenient for use in smaller type desiccators of 3 cubic feet or less, packages, and for transportation. The desiccant has a reversible action. Once it has adsorbed all the moisture it can hold, indicated by a color change from blue to pink, it can be regenerated easily by microwave (15-20 seconds) or conventional oven (3 hours @ 240°F/115°C). Once it is regenerated it turns back to blue. DRI-BOX®size is 55 x 55 x 25mm, total weight is 67g, dessicant weight is 46g. This efficient drying is carried out by a hard, clear, porous, beaded, amorphous form of silica gel. The desiccant has a myriad of microscopic pores which explains its great moisture-attracting capacity. Translucent beads look and feel dry even when saturated. Dust-free and attrition-proof. May be regenerated by heating with no loss of efficiency. Approximate volume of 1 pound (454 grams) of bulk desiccant is 0.53 quart (0.5 liter). Eliminate the messy, time-consuming job of changing loose desiccant. Convenient, easy-to-handle Desiccant in a Cartridge fits into the bottom section of standard glass or plastic desiccators. The cartridge consists of a durable polyester-felt bag with a perforated Mylar® cover sealed in place. It is filled with indicating silica gel beads which change color from blue when dry to pink when moist. Saturated gel can be regenerated in a 300°F (150°C) vented oven for 3 hours or more (depending on size) until blue color returns. May be reactivated repeatedly without degradation. Individually sealed in a moisture-proof pouch.